The walls of Heidelberg, Germany, in the '90s were transformed by emerging artists, armed only with simple cans of spray paint, yearning to leave their mark on the world, and high school student Jesse Smith was right there in the thick of it. "That place was covered in graffiti," he recalls. "You couldn't go anywhere without seeing it. It was part of the culture." After being exposed to the bright aerosol murals for a year or so, Jesse tried his hand at graffiti. "I never really painted with anyone who knew anything about graffiti, so my stuff looked horrible," he laughs. "I once took a couple of buddies out painting with me—I spent about 10 minutes putting together this piece, and after I was finished, I stood back to look at it and my buddies had painted Hs and d*cks all up and down the wall. I remember being really embarrassed that my piece was associated with that wall." Embarrassment aside, it was that time spent in Heidelberg that breathed new life into Jesse's artwork. Until the age of 17, most of his work was done in black and gray and, though his mother urged him to explore color, it wasn't until he began writing on walls that color started to show up in his pieces. 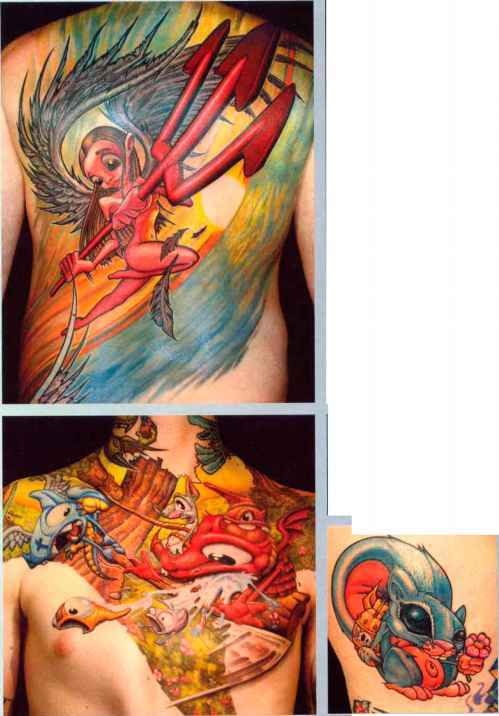 With a lack of lowbrow artwork available in Germany at the time, Jesse referenced graffiti mags and visited a local tattoo shop to study the flash and gain inspiration. 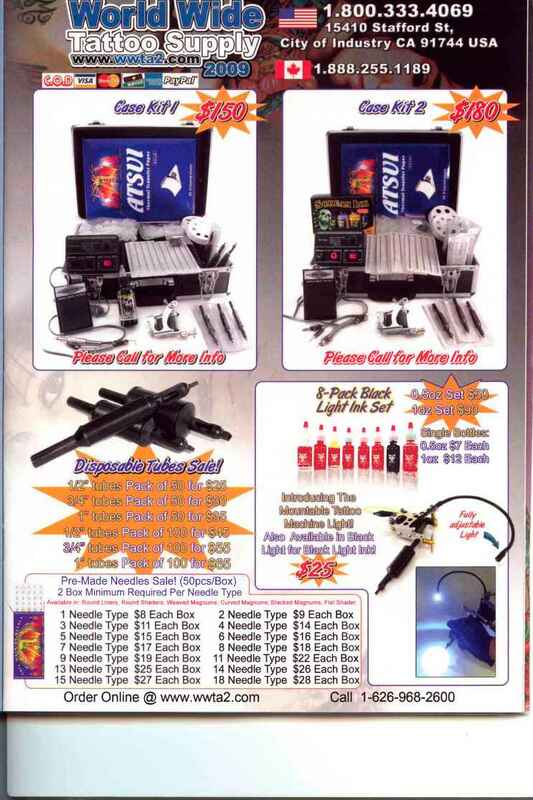 As a military kid, it was eventually time to return to the United States, and once here, Jesse hooked up with a tattoo artist who taught him how to make his first tattoo machine. "I originally only planned on doing one tattoo, but as soon as word got out that I was doing tattoos, people started lining up at the door. Not because I was good," Jesse says with a smile, "but because I was doing tattoos for next to nothing." Jesse has been tattooing professionally for 10 years now, and his work has become heavily influenced by the lowbrow movement that has surfaced on the West Coast. 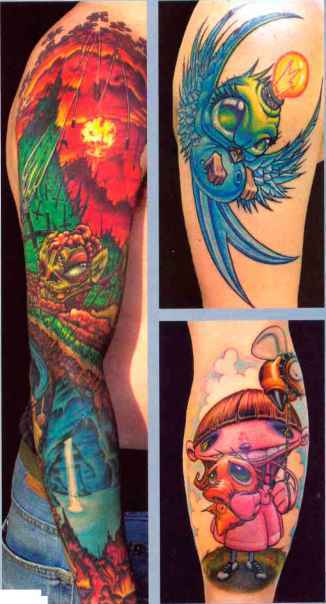 Lowbrow art, spawned by graffiti, tattoo, and comic book artists, is right up Jesse's alley, as he has been a cartoon aficionado since back in the day when he would copy them straight out of skateboard magazines. Taking rather serious topics and illustrating them in a lighthearted way, Jesse incorporates political and religious undertones that represent his perspective on world issues. 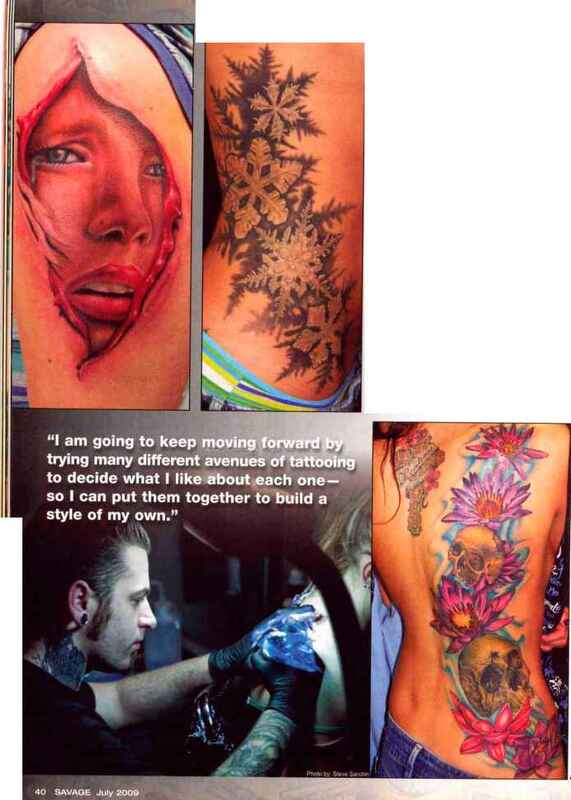 "I try and create overlapping stories between my tattoos," he adds. "I like the idea that two of my clients who have never met are connected in some sort of way." To keep his artistic drive continuously unfolding, Jesse embraces a variety of mediums and keeps current with the art community. "I'm constantly looking for new artists to gather inspiration from," he explains. "It's kinda hard for you to push the limits if you're not paying attention to what's going on in the art world around you. Working with other artists keeps me on my toes because everyone seems to give you a different perspective on what you can do to improve your work." Painting is a particularly appealing avenue to Jesse and he uses it regularly to keep his art fresh. "I enjoy being able to finish a piece in a rather short amount of time," he says. "I don't have to worry about my canvas' financial situation, pain tolerance, or whether it's digging my ideas." Influenced by many different techniques and mediums, Jon is a well-rounded artist who takes every opportunity to enhance his artistic abilities. "Painting with acrylic on canvas, I find I can learn some color and texture styles to bring back into tattooing," he explains. "I feel that bringing the two mediums together helps each one grow. I would like to get into some other forms, like watercolors and pastels, to see what each one can bring to the table." 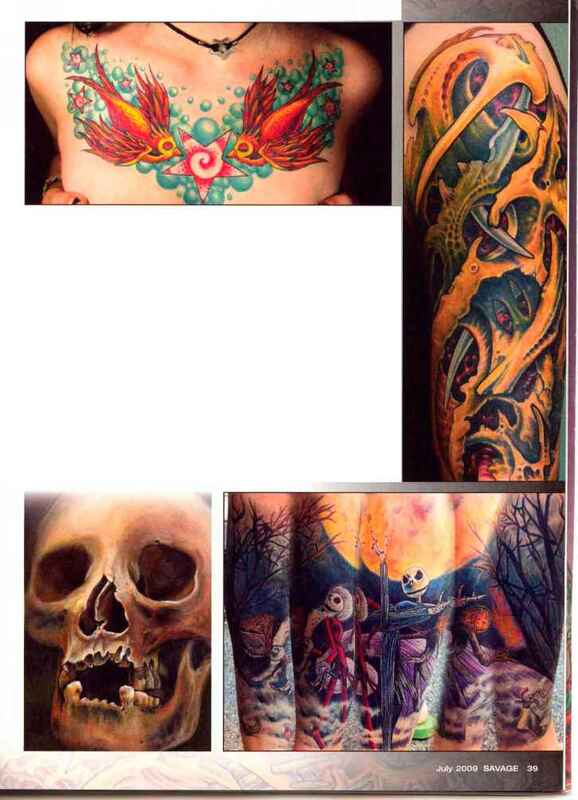 Jon's tattoo work tends to lean toward realism, with the use of an organic, flowing style. Textures and organic forms, such as floral and bio-mech pieces, with more of an earthy, "toothy-bone" feel to them are among Jon's strong points. The muted colors and overall feel of neo-traditional work has also captured the artist's attention, so it won't be long before more of these pieces make an appearance in his portfolio. For Jon von Glahn, a native Minnesotan, art has taken an influential position throughout his entire life. Always interested in drawing and painting, Jon took every art class possible in school. "I got away with taking more art classes than allowed," he laughs. "For some reason the art teachers let me in the art room during study hall and, before school, I was hanging out in there drawing, painting and sculpting." While most students who ditch class vacate the campus immediately to wreak havoc, Jon was quite the opposite. "Sometimes," he admits, "I'd skip class and instead of leaving school, I would go in the art room to finish up a project." Nothing could suppress Jon's appetite for art and, after high school, he earned a degree In graphic design and worked in that field for some time, further broadening his consciousness of art. "After awhile, I needed something more, so I started to explore other avenues," he says. It didn't take long before Jon was turned onto a new medium—tattooing. "I am going to keep moving fo trying many different avenues of to decide what I like about each one— so I can put them together to build a style of my own." son in bed at night. But the art doesn't stop there; Jon says his boy loves Daddy's tattoos. "He is very interested In all the photos of my work and we do a lot of drawing and painting together." 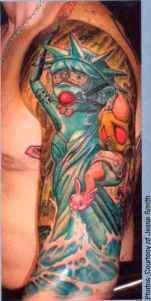 Jon even has a portrait on his ribs of the little guy painting. "He has watched me many times while tattooing and I swear he is watching how I am moving my hand and even the actual technique of it I can't wait until the day he can actually tattoo me—even though it won't look very good, it will be my favorite one." 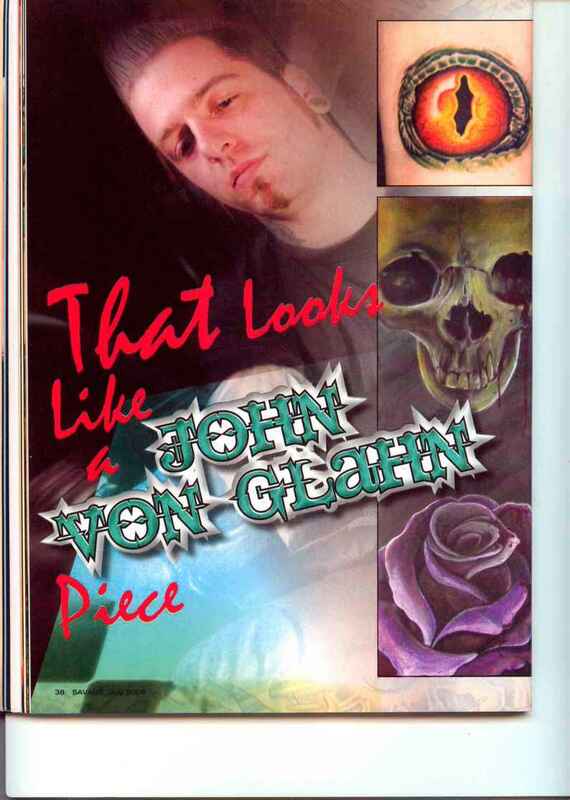 Will the young von Glahn be making an appearance in the tattoo world later in life? "At this point, I can see him being interested in tattooing, but who knows? I just give him as many art supplies as he needs and I will let him decide from there."